Today, Ele and I went to London to take part in an emergency protest outside Parliament. Click here for the pics. The protest was to demand the removal of British troops from Iraq and also to support relatives of British troops who were trying to present a wreath to Tony Blair. Downing Street was plunged into a row with Scotland Yard today after soldiers’ relatives were banned from laying a wreath outside No10. Families of those killed and serving in Iraq reacted with fury when police told them they could not make the gesture or hold a minute’s silence on the steps of the Prime Minister’s residence. A No 10 spokeswoman blamed police for the ban, but was forced to backtrack once Scotland Yard pointed out that its officers were following orders. Notice how the scum even tried to pin the blame onto the hapless police? How cowardly and mendacious can the Blair regime get? James Buchanan’s youngest son Craig, 24, is at Camp Dogwood in the so-called triangle of death, while Gary, 27, has just returned from Iraq. And in a withering attack on the Defence Secretary [Geoff Hoon] he added: “If I saw him in the street I will kill him. I will slit that man’s throat. Compared to the last national demo or even some of the smaller events, today’s protest was tiny. But I’m so glad we went. I got to hear, first-hand, what relatives of soldiers killed in Iraq think. Not via a website or a paper or the increasingly pro-Bush/Blair TV news but from their own mouths. Blair lied and now British troops are dying. Add them to the pile of 100,000 Iraqi bodies. I heard the voices of the relatives of British military today. They’re calling for you to support the troops. How? By helping their campaign to bring them home. Alive. Disabled People Are Funny, Aren’t They? LONDON (AP) – Britain’s most famous scientist, Stephen Hawking, condemned the U.S. led invasion of Iraq as a “war crime” and said Tuesday it was based on lies. Hawking, the bestselling author of A Brief History Of Time, was joined by other public figures. Similar events were being held in Spain, Italy, Australia, the United States and Iraq. 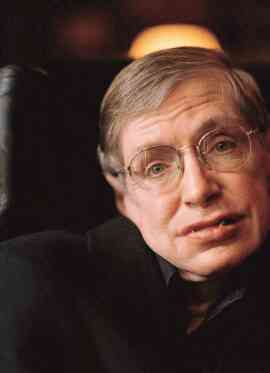 No doubt hilarious wags will now be composing antiwar rants in poor impersonations of Hawking’s speech synthesizer. I’ve been a fan of Hawking’s for a long time. I’m not clever enough to understand even a baby version of the maths behind his theories but I can just about follow the pop-science versions that Hawking has provided in classic books like ‘A Brief History of Time.’ I don’t subscribe to the sentimental vision of Hawking: ‘oooh, look at the poor dear, trapped in that wheelchair, isn’t he brave?’ If you know anything about Hawking’s life, you’ll know this is a laughably inaccurate view of how he feels about his disability. But it does irk me when all Hawking becomes is a crap joke for halfwits everywhere. The barely literate lampooning someone whose mind has soared through the light years between stars and the boiling vacuum between atoms. There’s a hint of Nazi anti-intellectualism in that humour as well. Not to mention that Nazis weren’t too keen on the disabled either. Not big on wheelchair access, Nazis. I only found out today that Hawking had spoken at this rally, over a week ago. I check the antiwar news everyday but saw no mention till now. I just tried a proper google and all I got were non-UK sites reporting his speech, nothing from the BBC. I suppose that shouldn’t come as a surprise: the last thing Blair wants on the telly is one of the finest minds of this generation calling him a war criminal. What would Blair’s comeback be? He couldn’t exactly call Hawking a moron, could he? Hawking is an inspiration. Not because he’s “brave” in the face of his disability or any such patronising shite. He’s an inspiration because he’s a world-famous intellectual who is speaking out against the war crime that the UK and US are committing in Iraq. Like Noam Chomsky, this will inevitably make Hawking villified by the crypto-fascist American Christian fundamentalists. They will heap insults and calumnies on his head as they do anyone who dares to stand up to the New American Empire. As always, their method will be argumentum ad hominem rather than addressing the facts in the Iraqi slaughter. So, Hawking is taking a personal risk in speaking out. He’s making powerful enemies. Think of all the famous people there are in British society. The classroom-quoted comedians, the bad lad footballers, people who command public attention. Think of all the “rebel” musicians, proudly displaying their drug-snorting, groupie-shagging antics in the tabloids. Oooh! So dangerous! Taking drugs your grandparents took – oooh, how big and clever! But what have any of these designer-label subversives said about the war? And yet, Stephen Hawking has. He didn’t have to: he could easily stay out of politics and keep his opinions to himself. But he’s added his voice to the millions around the world that now regard Bush and Blair as war criminals. He’s realised that silence equals complicity in this war crime. I wish more people thought like Stephen.